Will You Allow Your Heart To Break? I woke up from the dream in an agitated state. Sweat was dripping down the side of my face, despite the fact that the fan was on overhead. It was the same recurring dream I had had several times the past two months; my four year old daughter from foster care, Ashley, and I holding hands and laughing. A happy dream, to be sure, under normal circumstances. This was not so happy, though, as the four year old child was no longer living with me. Later that afternoon, my wife mentioned that she had had a similar dream last evening about Ashely, as well. My wife had not stopped grieving the loss of little Ashley in our home, as her tears had been flowing freely, both in home and in public. Ashely came to live with us a year ago, a victim of severe neglect as well as horrific sexual abuse from a biological family member of hers. When she arrived at our home, the frightened girl's vocabulary was not only limited, she could not speak a word, only grunting and pointing. Her eating and toilet skills were also negligible, and it was as if we had an infant in our home. Now, after nearly a year in our home, the four year old was speaking in sentences, eating healthy, and more importantly, laughing and smiling. Due to regulations and policies from the child welfare agency in our state revolving around the fact that she was one of four siblings, little Ashley was placed in another home. Days leading to her moving from our home to her new one, Ashley would ask my wife and I, "Mommy and Daddy, will you cry when I leave?" That question alone opened up the tear ducts in both my wife and myself. Now, Ashley was gone, hopefully living with her forever family; a family that would adopt her and her siblings. For this, I tried to find joy in this fact, as we were simply unable to adopt her and her other siblings, for a variety of reasons. To be sure, adoption was no stranger to us, as we had adopted three of our own children from the foster care system. Yet, Ashley was unique. Ashley was different. All who met the little one were captivated by her smile, under the spell of her laughter, and loved by all she met. Ashely was our daughter, as are all of the children from foster care who come to live with us. On this morning, I was once again grappling with the heartache that gripped my heart since Ashley left. The pain I felt at times was too much to bear, leaving me in tears. As I travel across the nation, working with foster parents, case workers, businesses, and churches speaking and consulting about foster care, I often hear the same response from so many who hear my story. I hear it as well from my own friends and family members. "I can never do what you do; it would hurt too much to give the children back." I am not a super hero. I am not an angel. I am not any different than anyone else. In fact, I am just like you. As a foster parent, perhaps the most difficult thing for me is when the child leaves. My heart breaks, as it is like losing my own child. I grieve and I cry. It DOES hurt to "give the child back," so to speak. Yet, the need is so very strong. With over 450,000 children in foster care on any given day, and not enough homes or families open to caring for these children, there is a very strong need for foster parents today. Sadly, the need is just as strong, if not more so, than ever before. For the 50 plus children that have come through my home, and through my family, I am a better person for it. For every child that has come to leave my home, my heart breaks, and I grieve. Yet, when I think about stopping, the phone rings, and there is another child out there who needs someone to love them, some to fight for them, some to protect them, and my wife and I answer that call. Perhaps it is a call you can answer as well. Perhaps you will allow your own heart to break, as you change the life of a child in need. 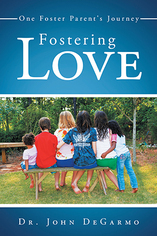 Purchase Dr. John's best selling inspirational memoir Fostering Love: One Foster Parent's Journey. Dr. John DeGarmo has been a foster parent for 13 years, now, and he and his wife have had over 50 children come through their home. He is a speaker and trainer on many topics about the foster care system, and travels around the nation delivering passionate, dynamic, energetic, and informative presentations. Dr. DeGarmo is the author of several foster care books, including the brand new book Faith and Foster Care: How We Impact God's Kingdom, and writes for several publications, including Fostering Families Today magazine. Dr. DeGarmo is the host of the weekly radio program Parent Factors with Dr. John, He can be contacted at drjohndegarmo@gmail, through his Facebook page, Dr. John DeGarmo, or at his website.